About a week and a half ago we had a bred heifer lose her calf. She was due March 3rd and I had just assumed something went wrong and it wasn’t meant to be. Well this morning I got to the farm and she had a little calf sticking her head out from under her belly. I thought it was an ET calf at first but she didn’t have an ear tag. Come to find out the heifer had twins in her belly and decided to hold on to one a bit longer then the other! The heifer that was born weighs 60 lbs. and has one eye that is a little blue/grey colored so something wasn’t right but she is a survivor that’s for sure! The black cow isn’t her momma just a curious neighbor. 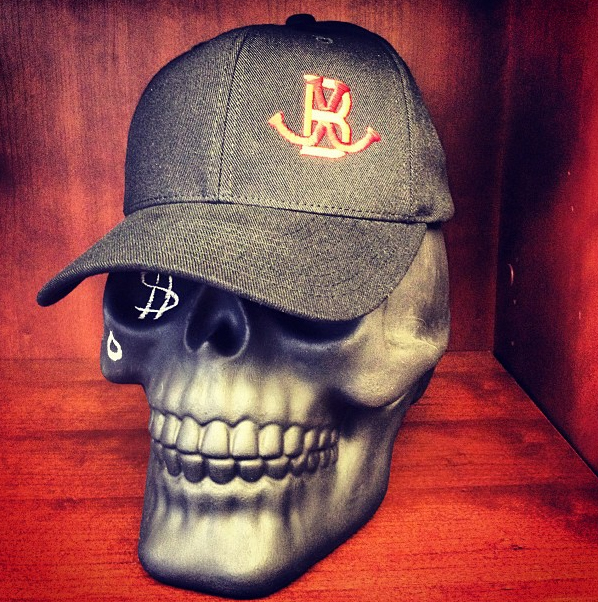 In celebration of reaching 1,000 likes on our Facebook page we are giving away 5 free JJB Hats! All you have to do to enter is head on over to the page (JJB Cattle Company) and like the picture below. We will announce the winners on Friday, January 25th. 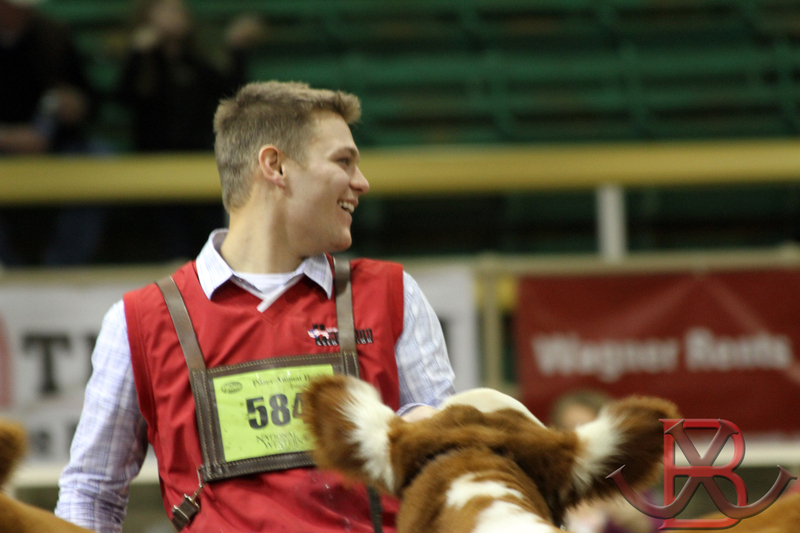 Denver 2013 is officially in the books for the Hereford breed. There are many things that can be said about the National Western, both negative and positive but I’m going to stick with the positive. So in no order here are my favorite things about this years National Western. 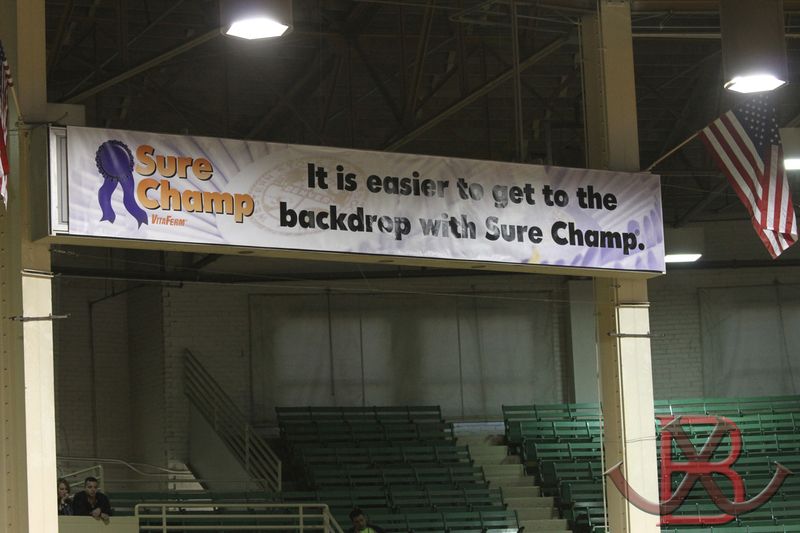 This year the National Hereford Sale “Mile High Night” was held in the arena where all the shows take place. It was AWESOME! The crowd was gigantic and the cattle were really good. Seeing Mr. Eddie Sims start the introductions for the sale all alone on top of the auction block in front of all those people was a moment I will never forget. Mr. Sims is a man who has done it all, at least twice, and to see him kick off that sale beaming with such pride was very special. It is a good reminder that no matter what you have done there is nothing that can keep you from doing even greater things in the future. Anyone who raises purebred cattle will tell you the same thing “It’s a people business” and that is one of the many things I love about raising Hereford cattle. I was able to hang out with friends from years past a reminisce about old times while making the times we will talk about down the road. Crystal and I also got to celebrate with friends after their big win and while celebrating the present we still looked to the future. I got to meet two cattleman who have left an immediate impression upon me. On is PJ Budler whom I had been introduced to in the past but for the first time got to know. PJ and his wife Koula have recently moved to Fort Worth from South Africa, it is PJ’s dream to market Hereford cattle on a global scale, and he will. There are some people that have a drive that will enable them to be successful at whatever they want and I feel the Budler’s are prime examples of that. Check out herefordbreeder.net for an insight into some of PJ’s work. The other cattleman I am very happy I had the chance to meet is Jason McDonald of Whispering Pine Farms. I had inquired about a bull on their website before Denver and had went down to look at him in the yards and got to meet Jason. You might have noticed Whispering Pine’s buying a lot of good cattle the past few years as I had and I was intrigued to meet then man behind the farm. I was very happy to find out what a nice guy Jason was, the Hereford breed is full of great people and he is one of them. The future is bright with Whispering Pines and I can’t wait to go and visit their farm. I met my wife at the National Western and she has been my greatest blessing, I hope that someone found theirs this year as well. I had a blast being able to kick back and watch the shows this year. Even though I get the feeling it may be one of my last just watching from the sidelines. The pen show was fun to watch with fellow Iowan and one of the first people to purchase a heifer from me, Bill Goehring being one of the three men on the judging panel. The cattle down in the yards were good and as I said in a previous post the management practices are always wildly different. If as producers we can achieve a common ground on how much condition these cattle should carry I think we would all be better off. But hell fat sells, the same guy that complains about fat bulls before the sale won’t buy one if he is too skinny. As far as the judging on the hill goes, some thought it was good, others bad, I guess I can see it both ways but that leads me to my last point. Thanks to Kay Cornelius for the picture! 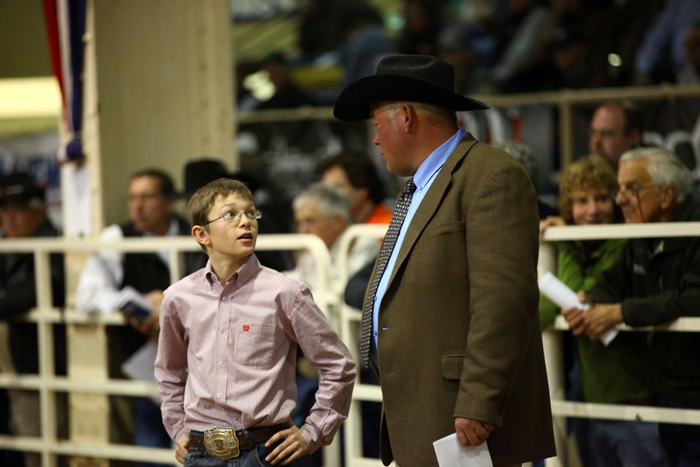 I don’t care what you think about the way Hampton placed the cattle and judged the show, him having his son out in the ring with him for a large portion of the female show was awesome. It reminds us why we do this. My dad and grandpa got me into showing cattle because they wanted me to grow-up with a sense of responsibility and pride in a completed project that I did not have before then. 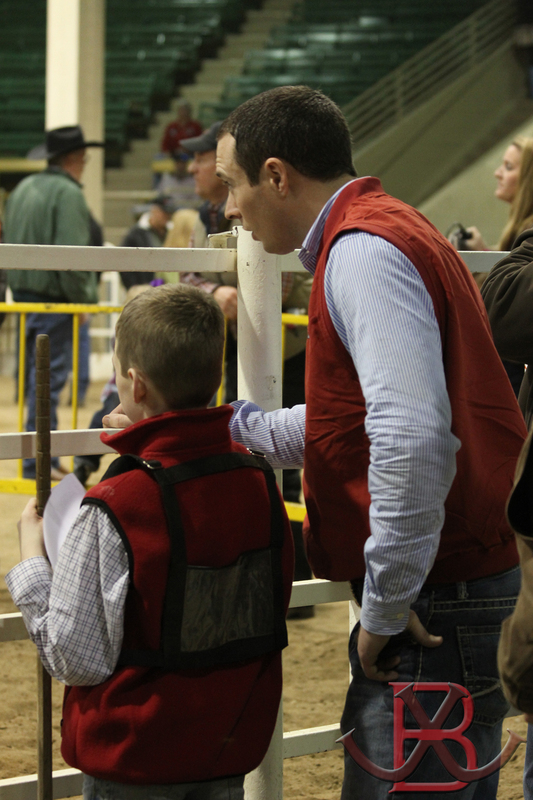 They also wanted to be able to spend time with me and the time that I have spent with my family at cattle shows and sales are most of my favorite memories. 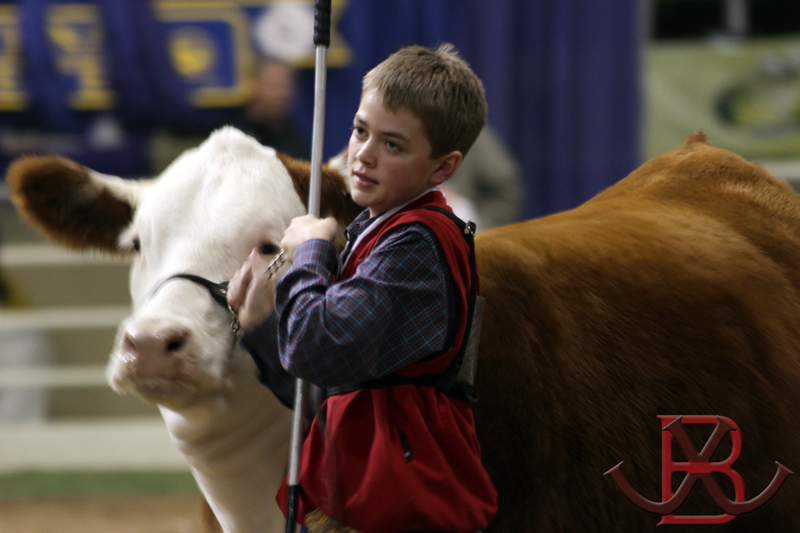 Just imagine the gift that Hampton has given his son, he got to evaluate cattle with his dad at the National Western Freaking Stock Show before he can even think about shaving! Man that is cool, I don’t care who you are! I haven’t even had the opportunity to show in the Open Show in Denver and that young man was able to look at the best Herefords in the world right along side his father. I hope that when Crystal & I decide to have a child we can make memories like that. I know that some of you would have liked some more posts during the Stock Show and I feel like I have let you down but will do better next year. As I have known for quite sometime now my dad has some very big shoes to fill and sometimes I come up short the first try. So now I am part of team #dobetter. All in all it was a great Denver with many people asking about Symphony, it really means a lot to get so many great compliments from people who have done it. We had an adventure getting to Denver this year. We were scheduled to arrive Wednesday night but due to computer issues we weren’t able to leave until Thursday. Then on Thursday our flight was delayed so we missed most of the bull show but what is important is we made it! Once we got here I ran up to the hill to watch the rest of the show while Crystal went to work in the Vita Ferm tent down in the yards. The bull show was a sight with many bulls that had an opportunity to win. The pen and carload shows were yesterday and the increase in numbers did not decrease the quality of the cattle. Very competitive show from top to bottom. Management practices become very apparent in the yards but they all have some good to them, to me it matters if they will do what you want them to once they get home. 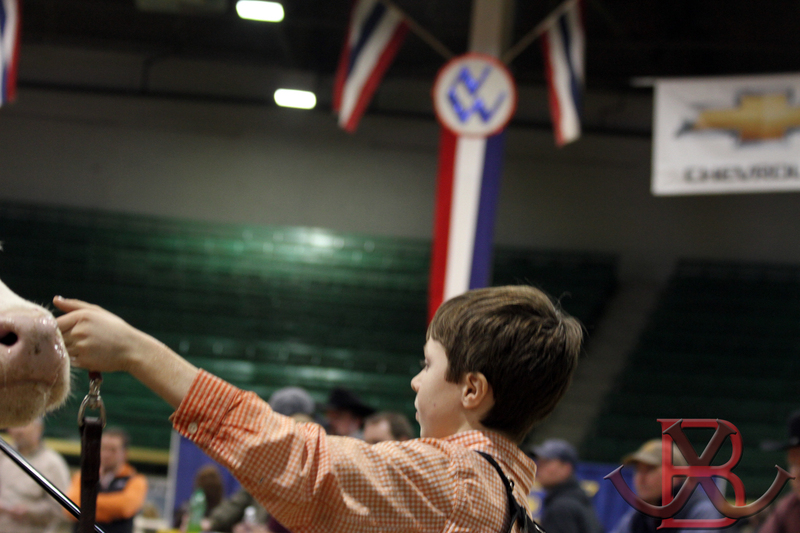 The National Sale was held in the arena this year and boy oh boy was it a hit! 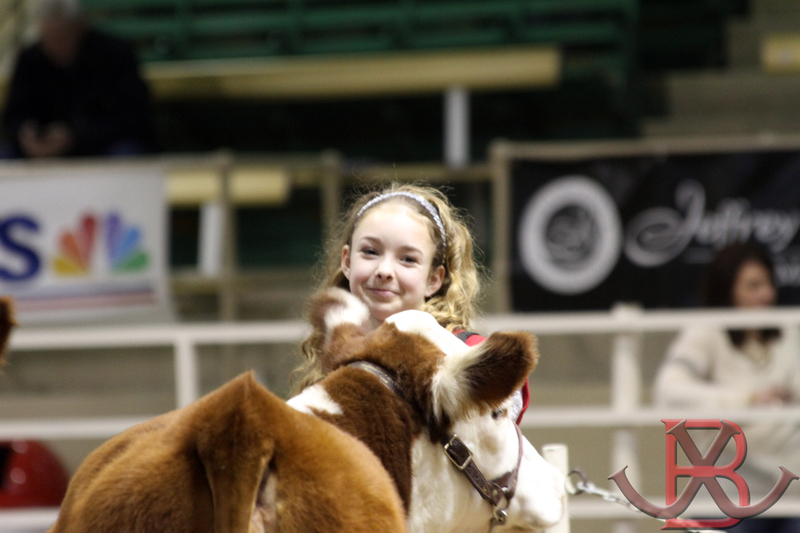 The arena was packed and some great Hereford cattle were sold. We bought a small share in a bull and I will post the video of him selling below. We are very excited to get back to the real world and figure out what cows we are going to breed him to. We have been snapping pictures and I will share a few today but many more once we get home. Female show is today and looks to be a great one. I came up with the slogan! For the past few years my dad has done a blog on the Star Lake website. It was always our biggest traffic getter and my dad’s pride and joy. This year there won’t be any posts by dad as he will not be attending the National Western. Instead you are going to be getting some updates from the pup. I am going to be walking around taking in the scenes and shows with the camera. Please keep checking back throughout the week. I’m not sure what the schedule will be for these posts, it will probably depend on what the Denver “nightlife” is like. For those of you unable to attend this years National Western never fear, Cattle in Motion will be broadcasting the show each day. Hopefully you will like the photos and my commentary won’t ruffle too many feathers but hey sometimes it just happens like that, Jack. A little while back Crystal told me that Christy Lee Couch was going to be calling me to do an interview for an article she was working on. This sounded exciting, when I asked what the article would be about Crystal told me it was about me losing my bid to get on the National Junior Hereford Association Board. At first I was reluctant, not getting on the board is easily one of the biggest failures I have experienced. Then I got thinking about it, maybe my insight will help someone else? Losing something that you want so badly, that was voted on by your friends and then to have it announced in-front of everyone is a hard pill to swallow. There have been many great young people that I have witnessed drifting off into the shadows after such a loss. I was lucky to receive some great encouragement from a woman who I barely knew at the time, Mrs. Mary Barber. The day after the vote was announced Mary pulled me to the side and let me know that she didn’t want to see me get discouraged and quit after not getting on the board. Her son Jason who is now my brother-in-law had run for the Jr. Board and failed to get on as well. At the Tunica Jr. National the Barber twins had more success then anyone else… ever. She told me to keep my head up and never quit, there would be plenty of other wins in my future. Sadly it took a while for Mrs. Barber’s advice to settle in. There were a few more bumps in the road after the Jr. National but once I finally got back on my horse the wins and good times started to roll and haven’t stopped. 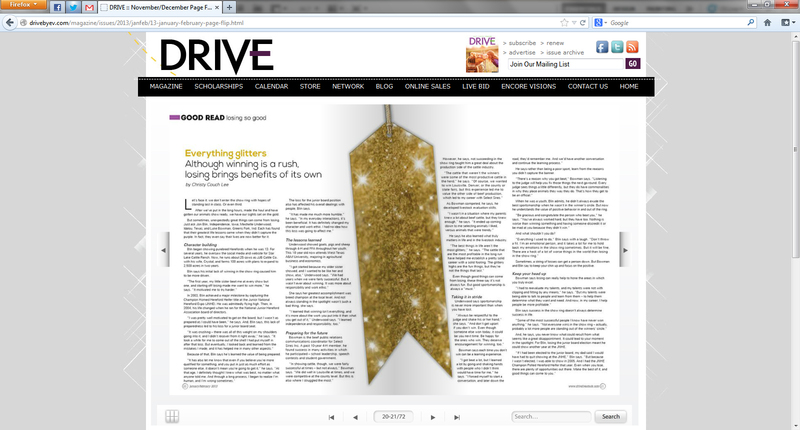 Click the picture below and flip to pages 20 & 21 to read the article. I hope that there is something to be learned from my missteps. We all need to do better then those who proceed us, this is how we achieve progress and progress benefits us all. Check out the video of Symphony below. She sells February 14th at the Iowa Beef Expo in Des Moines. The sale will also be broadcast on LiveAuctions.tv. If you have any questions please feel free to contact us. This heifer is the real deal and will be a big time competitor in the showing. 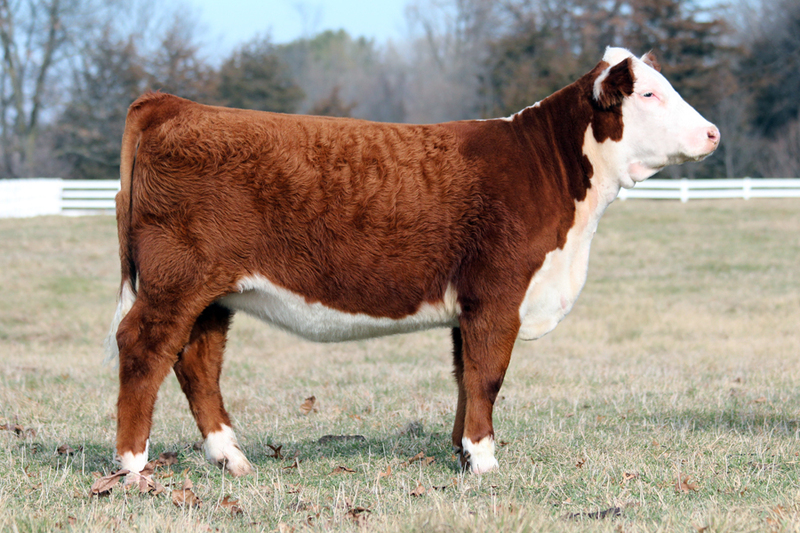 If you are still looking for that special heifer to send your showstring over the top, your search is over. SYMPHONY IS THE ONE! 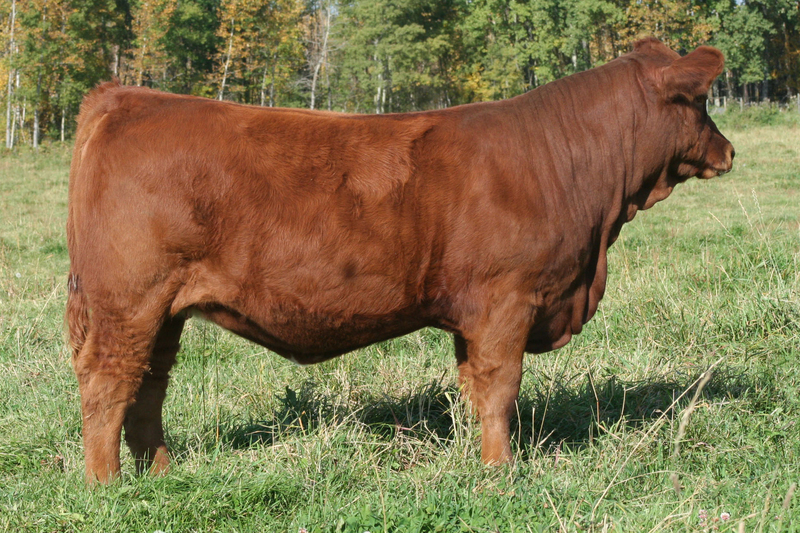 Big Simmental Sale Coming Up! You don’t see too much of them here on the JJB website but Crystal’s family raises Simmental cattle in Canada. We still own a few with them but the number is shrinking, and the number will go down by two on the 15th of December at Checkers. The pair selling is very exciting, the cow is out of Crystal’s cow Signature and the calf is sired by Revolution who is the sire of a great set of females for High Country. 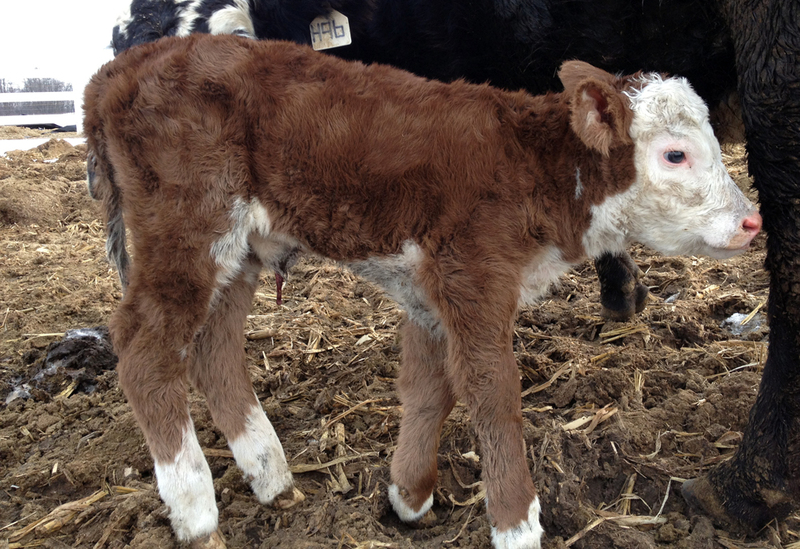 The really good news is that the cow is bred back the same way, tons of predictability built in! These are two awesome females that you can build a herd around. The sale will be broadcast on LiveAuctions.tv. If you have any questions give Crystal a call at (816)244-2394 or if you want to make an international call give Rob & Dee a call at (780)696-3643 or (780)514-0758. You can also get in contact with Rob & Dee via their website. You can read more about them in the sale catalog below! 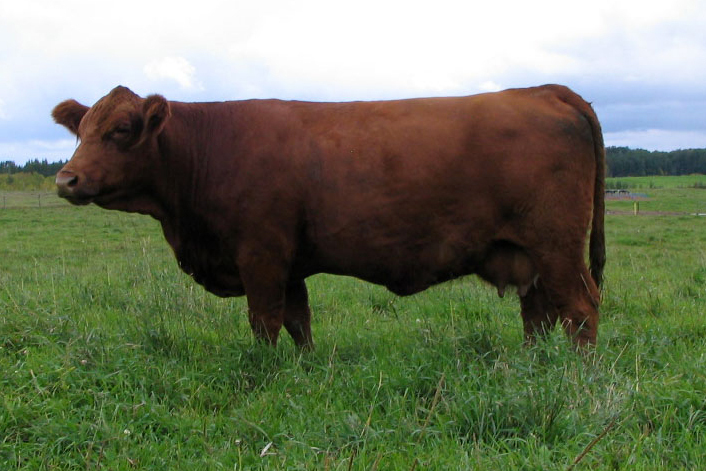 We currently have a couple of heifers available via private treaty. The first up to the plate is Celeste. This March 5th born heifer is sired by Advance S109 who was one of the most popular sires in the recent Star Lake dispersal and her damn is the 173P cow who is the dam of Lock-N-Load and was one of the featured cow families in the dispersal sale as well. Celeste has a great set of EPD’s to go along with her beautiful phenotype. You can view her pedigree and EPD’s by clicking here. This is one good heifer that deserves a good home! If you have any questions about Celeste please contact us.